In 1854, at the age of 27, Otis Gibson, a graduate of Dickinson College, was appointed a missionary to China, along with Dr. Erastus Wentworth, professor of natural sciences at Dickinson and one of the original sponsors of the Methodist Episcopal Church’s China Mission. Gibson and his wife reached Fuzhou (Foochow) on August 13, 1855. 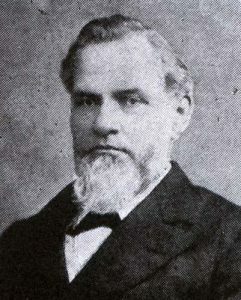 In Fuzhou, Gibson undertook evangelistic work. The Missionary Society decided in 1856 that a boarding school should be established for the boys besides the day school already in existence and Otis Gibson undertook the task. Children between the years of twelve and eighteen were accepted on the written agreement of parent or guardian, for a period of four to six years. The school furnished, in addition to instruction, clothes, and books, both room and board, for the purpose of providing a Christian home for the students. Mrs. Gibson’s ill health necessitated the couple’s return to the United States, where Otis Gibson served pastorates in California. In 1868 Gibson began work as Methodist missionary to Pacific-coast Chinese. On his initiative four Sunday schools were organized within a year, three in San Francisco, and one in San Jose. Preceding Gibson’s arrival a school had been begun on October 25, 1865, in the Powell Street Methodist Church San Francisco. Despite the fact that Gibson was not conversant with the Cantonese dialect, he soon had a vigorous program under way. Advance was recorded when on Christmas Day, 1870, the Chinese Mission House, costing $30,000, deeded to the Missionary Society of the Methodist Episcopal Church, was dedicated. This at once became the chief center for Methodist Chinese Mission activities in the San Francisco area. Gibson not only tended to Chinese immigrants’ spiritual and education needs; he worked to ensure their rights in their new country. Gibson was one of the few American voices that spoke out loudly against the Chinese Exclusion Acts of 1882. In 1877, Gibson began to give Christian instruction to two recent Japanese immigrants, Kanichi Miyama and K. Nonaka. This led to six Japanese being baptized two years later, the beginnings of Methodist work among Japanese immigrants to the United States. Otis Gibson was compelled, on account of ill health, to give up the superintendency of the California Chinese Mission in 1884. His death occurred on January 25, 1889. Adapted by David W. Scott from Wade Crawford Barclay, History of Methodist Missions, Vol. 3: Widening Horizons, 1845-95. (New York: The Board of Missions of The Methodist Church, 1957), 287-289, 292, 376-381.